Honoring the military is part of the fabric of the NFL. This support takes place both at home and abroad, with NFL players and coaches traveling overseas to salute the troops, as well as with team recognition of our servicemen and women through the NFL's Salute to Service. Through its long-standing partnerships and support from our 32 teams, the NFL takes pride in supporting military personnel and remains committed to raising awareness for the sacrifices they make on our behalf. Year-round, the league works with its military non-profit partners including the Pat Tillman Foundation, USO, TAPS and Wounded Warrior Project, to fund programs and provide resources that positively impact veterans and active duty military members and their families. 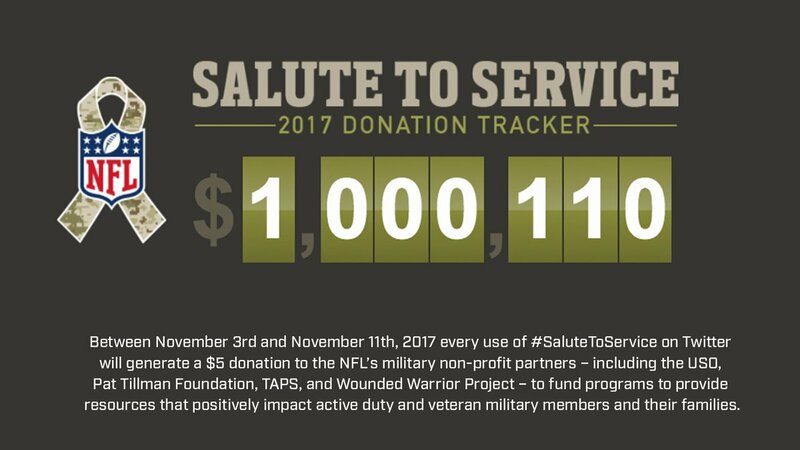 Since 2011, the NFL has raised more than $17 million for its military non-profit partners.